A 240 ya 3-wood off the tee. It was good as it went dead center in the small chute of the approach to the green, it was that clean hit, baby draw, soaring ball flight that Iï¸ wish they all would do. My 334 yard drive that rolled through the group in front of us...oops. Yes I cut the corner, and it was downhill but still, I've never gotten one that far. And to show their appreciation for my shot, they stomped it into the grass as they played on. That dang 2-Ball needs to get its arse in gear! I had a good one today. I was short sided about 15 yds off the green. Had to hit a flop shot. The guy I was playing had 7' for par. I dunk the flop shot for birdie and needless to say his 7'er meant nothing. The last putt because it meant my round was over. The only things that I did right were not breaking a club or ruining the day for my playing partners. We've all had days like that. This too shall pass..
What I had in mind: Baby fade, 222 yard Par3, into the wind. wanted to leave it short for a 2 putt par below the pin. What happened: 4 iron, punch/bullet/semi-skull fade to 2 feet. birdie. Nailed a few 3 woods really cleanly, but best shot was a pured 5 iron, up a hill and over the death sandtrap, which actually spun back 5 feet, cuz it's a steep green. Left an 8 foot putt that I babied to the hole and missed by 1/2â€. Then the putt kept rolling about 12' past the cup and so I 3 putted for bogie. I hate that green. Hit an 8i from 154, over a tree, to 7' feet for my first birdie of the day. 5i from about 190 to 25' for eagle (short par 5 and I piped my drive). I hit some quality golf shots today, but also some absolute garbage ones. I had an eagle today too like yours. Banged a good drive, smoked a 5 iron to 10' , and drained the putt. Mine was every time driver came out of the bag - every tee shot really - I missed one fairway but that was a non-factor with the rough dormant. Best of all I hit every tee shot solid. I hit 2 really nice 6 irons. One was 185 that rode a L to R cross breeze about 10y and nearly stopped dead. The other was 179 uphill ball above feet pin right that smacked the backstop and trundled down and to the right to finish near the hole. That's some strong 6 irons! Mine was the double cask MaCallan on 19. Trump National 530yd par 4 18th. Went driver 255, still had 303 into far back flag. Had to chip on the green from 15feet or face 20 yard pitch back up the ocean cliff. Awesome par to save our match and break 80 on the day. Dusting this thread off to tell (brag) about one I hit yesterday in my first league match of the season. There's a row of 3 bunkers along the right side of the fairway (the third is actually a greenside bunker). I hit it into the 1st which had been newly replenished with sandbox sand. The tee ball splashed and rolled just outside of the fried egg. 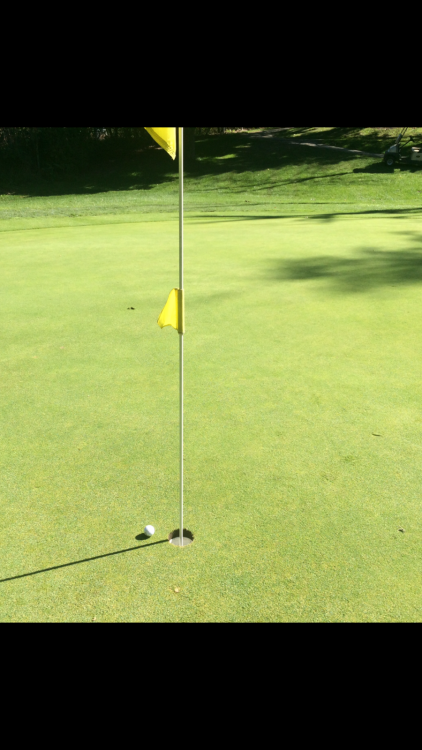 Had 77 yards to the pin. Needed to clear the 2nd and 3rd bunker but somehow stop it on the narrow part of the green. Took the 52* and squarely blasted out with an abbreviated follow through. Got a face-full of sand but could see the ball tracking at the pin on a medium-low trajectory through the haze of the particles I just threw up into the wind. Ball landed past the pin on the smallish backstop and spun back downhill slowly. As I started to rake the bunker, it was still trundling backwards and settled within 2 feet of the cup. Best part was, I actually made the birdie putt on a recently-aerated green. I've got a snake bite about me where I tend to miss shorties after good shots. #7 at Warm Springs here in Boise last Saturday. 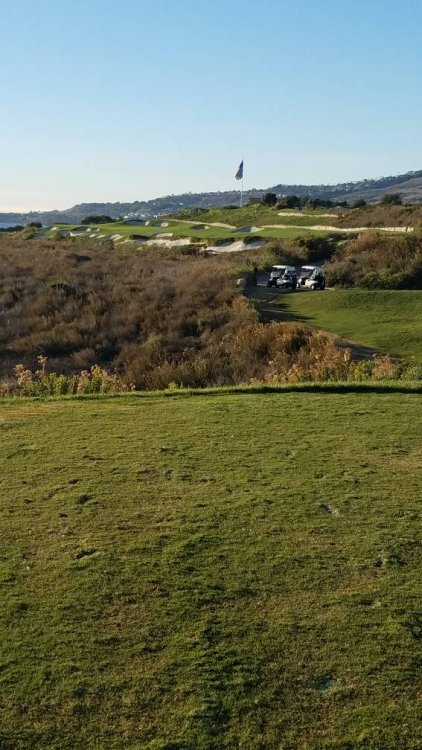 It's a dog-leg right, par-4 with water to the right that you can either hit straight and keep away from the water and have a long 4 or 6i into the green...or... go for it and drive it over the water and have a 9i or wedge in. I chose to go for it..! With driver and a "new" ball", I roped a power fade straight over the water, through a couple of trees and landed middle fairway with 95 to go. Struck a PW in left and 2-putted for the par.